Child Care Salt Lake City - Teaching Gratitude | Child Time Inc.
We all have bad days. Sometimes those bad days turn into a tough month, a few months, or even just a challenging year. Bad times are a part of life, and they’re no one’s favorite. But they teach us resilience and strengthen our character, as long as we know how to handle the turbulent times at hand. Teaching gratitude is one of the best ways you can help your child cope and persevere through the tough times. It’s a skill that needs to be practiced and encouraged all throughout our lives, and your child is never too young to start thinking about gratitude. Our child care center doesn’t only focus on academics and the Reggio Emilia philosophy — we know that character development, especially at a young age, is just as important to teach. Gratitude will continue to be a focus for our child care classrooms. Find out more about how you can teach gratitude to your child, learn about our early care and preschool programs, and set up a tour with Child Time Inc. today. Gratitude is a skill that’s not inherently learned, it’s one that requires practice and encouragement. It’s truly one of the best traits a person can have, and it’s one that serves each of us well when we need it most. No one likes being stressed, but did you know that stress actually can make you sick? Chronic stress can cause disease, it can make existing illnesses or conditions worse, and it can also make for a more difficult recovery. There’s no pill that can make stress magically disappear, but positive thinking is the solution that’s proven to reduce stress. When you practice gratitude, you’re reframing your negative thoughts into positive ones, and combating stress (and its physical downfalls) in the process. Like we said, bad days are bound to happen. As much as you’d like to protect your child from them, it’s better to teach your young one how to cope and get through it. This makes them stronger individuals who are more capable and resilient. Even in the worst situations, there is always something to be grateful for. This isn’t to invalidate negative experiences — you and everyone else are absolutely allowed to feel pain. But if we only let the negative things consume us, we won’t be in the position to move forward and grow. Practicing gratitude is how we focus on the things that we do have instead of all the things we don’t. Take 15 seconds to think of five things you’re grateful for, and you’ll find you instantly feel better. Gratitude offers great perspective and is a mood booster, and it’s one that never ceases to work. 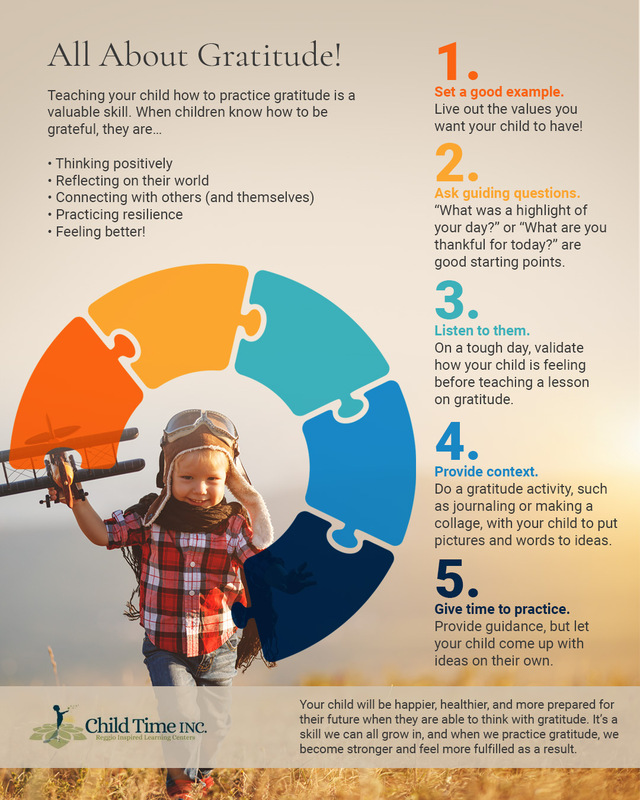 When you teach your child to practice gratitude, they’ll begin to make it a habit (with your support), and they’ll be more self-aware and positive on the whole — plus, they’ll feel better, and you will too! How do I teach gratitude? On a good day, a bad day, and all the normal days in between, make it a habit of stating what you’re grateful for. Have a discussion with your partner, your friends, your children, and really, anyone who’s important in your life. Children pick up on everything; when you lead by example, you’re setting them up for success just by being authentic. What were some highlights of your day? Today I’m feeling grateful for our home, having lots of good food to eat, and you! What are you grateful for? Validate and empathize before expecting gratitude. Always make sure your child knows they are loved, cared for, and understood before you expect them to dive into the good things in their life. Even if their worries or strife seem inconsequential, it’s not to them. It’s like the classic example of someone who needs stitches versus someone with a broken limb: even though one injury is worse, it doesn’t mean the other injury doesn’t also hurt. Make an easy-to-reference chart with your child. Where words fail (especially for young children at times), pictures speak. Draw pictures, cut out photos from magazines, and make a collage as a family for the things you’re grateful for. You could even put together a box or a jar full of objects and things that symbolize your gratitude. Having a concrete representation is a great reference point for your child, and helps provide even more context — especially at a young age. Plus, they’ll have so much fun working on a hands-on, creative project with you! Give children opportunities to practice. You might need to prompt your child at first, but eventually, the goal is that they do this independently — and when that happens, praise them for it! One of the best ways to give children a chance to practice their gratitude is by enrolling them in a child care program like those that are available at Child Time Inc. Located all throughout the SLC area, it’s never been easier for your child to get the academic start they need in an environment that’s designed to help them grow. 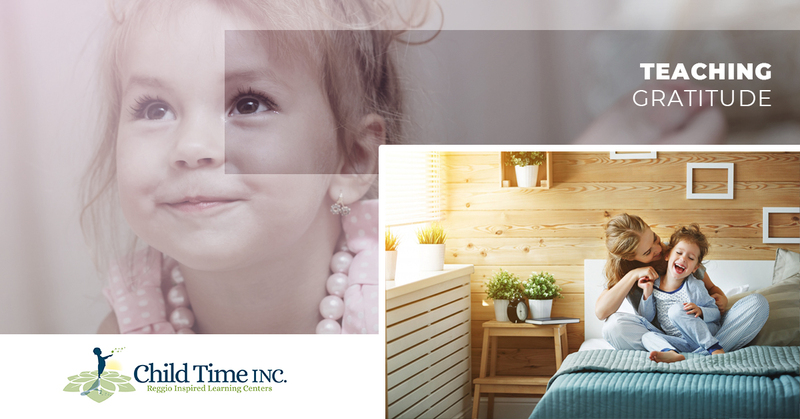 Offering programs for infants, young toddlers, preschoolers, pre-kindergarteners, and after-school care, Child Time Inc. is the place for your child to thrive. Set up a tour with one of our child care centers to see our work in action. Until then, good luck practicing gratitude, and have fun!